a field (sometimes hidden) recorded during a form submission. Below are 2 typical examples of using the dynamic data on HTML pages. During recording, WAPT Pro records this sequence of HTTP requests, but the static value of SessionID would not be used to play this sequence back during test run. After sending the second request an error will occur. The reason is that we try to use the old value of SessionID. When some user submits a form on your site, a unique number is sent to the server together with all information entered by the user. The number is kept in a hidden field of HTML code. It will be different in a new browser session. When you run the test, web server will be unable to recognize that number. These problems are successfully resolved in WAPT Pro by the usage of variables in recorded test scenario. In both examples, you can define variables and replace the dynamic data with them. To use a request parameter to transmit a session variable. Using functions Hidden and Parameter from URL. The Search parameter function can be used in both cases. Add..: Opens the Edit Variable dialog where you can create a new variable and select a function for its calculation. Note that created variable will be available only in subsequent requests. Name: Here you can change variable name. Formula: Here you can view the defined formula for calculation of the current variable. This field is accessible only for viewing. Functions: The list of functions for calculation of the current variable is displayed in this field. You can define several functions for the same variable. Results of those functions will be concatenated to form more complicated values. 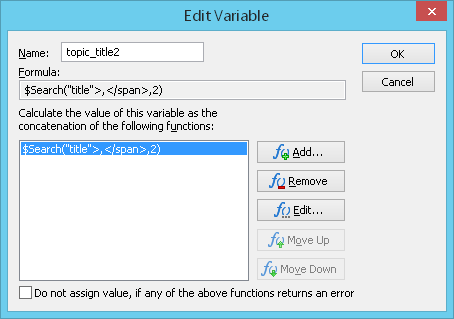 Add..: Opens the Edit Function dialog where you can select a function for calculation of the current variable. Edit..: Opens the Edit Function dialog where you can edit selected function or choose another function. Move Up: Moves selected function one step up in the list (if you defined several functions for the same variable). Do not assign value, if any of the above functions returns an error: This option allows to keep an old value of variable if any of the displayed functions returns an error. In this case the value of variable is not changed. It is useful when variable is calculated as the concatenation of several functions (and some of them returns an error), or if variable is calculated in a cycle (and its value changes with each iteration), or if variable is calculated several times in profile in different requests. Here you can read the detailed description of WAPT Pro functions that can be used for calculation of the values of session variables to form the correct URL during run-time.